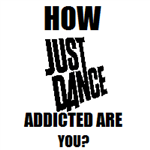 Quiz App » How Just Dance Addicted Are You? How Just Dance Addicted Are You? Are you addicted to Ubisoft's Game 'Just Dance'? Answer a few questions to find out! It's friday - what are you doing? I will definitely NOT play Just Dance! I'm not sure. Either I'm playing Just Dance or I'm going to the Mall with Jessica and Tori! I'm reading a book. After that, I'll get something to eat for dinner. After dinner, I may play Just Dance. Of course I'll play Just Dance with my friends! Which of the following is your favourite Videogame? If you like Just Dance, why? I don't like Just Dance. Next question! I like the choreopraphies. They're very funny when you play with friends! I like the tracklists from all games. They're AWESOME! I love the costumes and backgrounds! They're beautiful! If you don't like Just Dance, why? I don't like the tracklists. Give me some Metal and Punk! YEAH! I don't really hate Just Dance, but on the other side, I don't really like it! I HATE Just Dance! I mean, look at these silly moves and ridiculous costumes! I like Just Dance. Next question! I want a better Tracklist. Can I make a suggestion? Just Dance is PERFECT! They shouldn't change anything! They should improve the graphics and the gameplay. Ubisoft should stop making Just Dance games. They're ridiculous! Far Cry and Assassin's Creed FTW!!! Last but not least: In which years have the games been released? I don't know lol. As you know, I HATE Just Dance! I only have the first two games; Just Dance 1 got released in 2009, Just Dance 2 in 2010. I don't know the other Release Dates! Ummm... Hasn't Just Dance 1 been released in 2009? Just Dance 2: 2010, Just Dance 3: 2011, Just Dance 4: 2012, Just Dance 2014: 2013. What? There are more games?! ?